A few weeks ago, an elderly woman died after wandering from a Minnesota assisted living facility barefoot in the middle of the night. When a facility caretaker noticed the woman was missing from her apartment, she immediately began searching for the missing resident and ultimately found her in the parking lot, but the amount of time that the woman had been out in the cold alone is unknown. This long-term care facility prides itself on providing assisted but independent living. While they have safeguards in place to keep out strangers, there isn’t a defense in place to ensure that residents remain safe inside as they are free to move around the facility as they please. Unfortunately, unsupervised resident wandering is more common – especially in the winter – than we would hope. Only a day later in London, a woman with dementia wandered from her assisted living community and died of hypothermia. Again, the amount of time this woman was exposed to the elements outside is unknown. Why is Wandering a Problem in an Aged Care Facility? To help prevent patient wandering, facilities can deploy unique tracking devices such as a real-time location system, alarm systems, staff strategies, and more. The easiest way to help empower residents with a feeling of control and freedom while still ensuring their safety and security throughout the assisted living facility is with an automated wander management system. This solution is programmable and allows certain residents to pass through designated common areas, such as recreation rooms, while others remain secured and protected within different areas via automated locking of doors and disabling of elevators. This provides residents with the ability to use the facility’s amenities and resources without having a sense of being on “lock down” but also offers the security of not allowing residents to wander into dangerous areas. 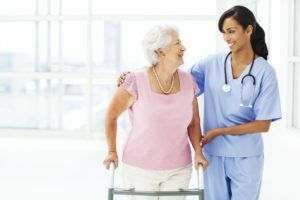 If a resident begins to wander out of bounds, staff members are immediately notified and can respectfully redirect them before they travel too far out-of-bounds. This avoids awkward encounters and dangerous situations as well as significantly reduces the amount of time caregivers spend searching for missing residents. To learn more about automated resident wandering solutions and how they can become an assisted living community’s first line of defense against wandering, download CenTrak’s Long-Term Care Resident Security Overview.